The sensors are used for speed and position sensing of rotating ferromagnetic target wheel, mark from magnetically soft material or magnetic target wheel with help of Hall Effect principle. 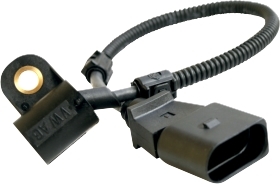 The sensor is designed for crankshaft speed sensing. This sensor has TPO (True Power On) feature. The sensor detects position at zero speed, that means when target wheel is not revolving and after switch-on of supply voltage. The sensor is designed for speed sensing of camshaft target wheel. It is manufactured in three versions according to cable length of 320, 420 and 1000 mm. The sensor is designed for speed and position sensing of camshaft target wheel with TPO feature. 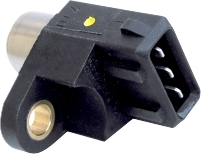 The sensor is suitable for speed sensing of crankshaft with high accuracy of angular displacement. The sensor is suitable for speed sensing and position detection of crankshaft with high accuracy of angular displacement. 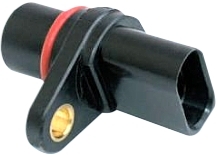 The sensor is designed for ABS and is manufactured in three versions which differ in cable length and placement of grommets.